« “Stalk. Murder. Repeat.” A great series but how widely is it being read? News reports have been floating around the last few months about the possibility of McClatchy, The Star’s deeply indebted owner, buying another newspaper chain, Tribune Publishing, which owns The Chicago Tribune and several other large papers, including the Orlando Sentinel and the Ft. Lauderdale Sun-Times. On Friday, Bloomberg reported McClatchy was one of three companies that had submitted bids for Tribune, and that Tribune’s board is scheduled to meet early next week, possibly to consider the bids. I’ve seen estimates of a sale bringing $640 million to $700 million. …But as far as McClatchy is concerned, allow me to put this story in perspective…Ha! Ha! Ha! Not only can a newspaper chain with an $800 million debt not buy another newspaper chain, it can’t afford new office furniture. — McClatchy has a stock market capitalization (total value of all outstanding shares) of about $57 million; Tribune’s market capitalization is about $570 million. So, we’re talking about one company buying another 10 times its size in terms of valuation. — This is not the first time McClatchy’s eyes have been bigger than its stomach. 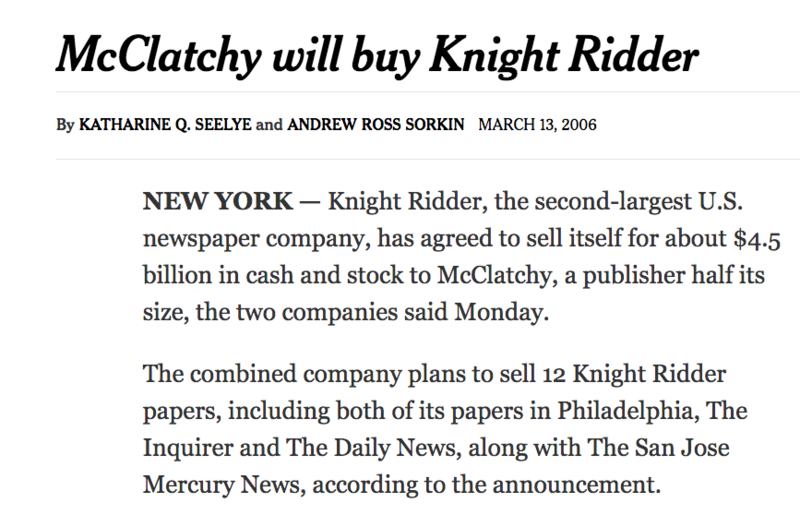 Remember what happened after relatively small McClatchy bought the much larger Knight Ridder newspaper chain back in 2006? That was a move one industry analyst likened to “a dolphin swallowing a small whale.” The result was McClatchy saddling itself with the massive debt it has been laboring under ever since. But what that would amount to, according to a friend who is an investment banker, would be McClatchy reorganizing without going through bankruptcy. And it wouldn’t be McClatchy money on the table; it would be somebody else’s. There are at least two ways McClatchy could nominally buy Tribune. :: Five months ago, a Los Angeles surgeon, entrepreneur and philanthropist named Patrick Soon-Shiong bought the Los Angeles Times and the San Diego Union-Tribune from Tribune Publishing for $500 million. Soon-Shiong also happens to be the largest shareholder in Tribune (a 25-percent share), and it’s possible he could end up controlling McClatchy by striking a deal with Chatham. Soon-Shiong is believed to be interested in McClatchy largely because of its string of California papers. If Soon-Shiong emerged as top dog, he could establish a 500-mile-long newspaper juggernaut from Sacramento (McClatchy’s home base) to San Diego. Now let’s take a look at the other two companies that Bloomberg says have submitted bids for Tribune. The other company reportedly in contention for Tribune is AIM Media, a fast-growing, private company that owns papers in at least four states — Texas, Ohio, Indiana and West Virginia. 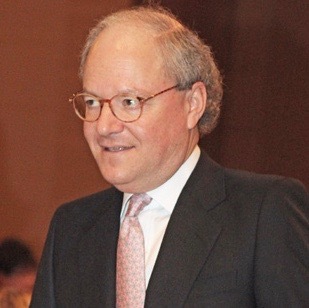 The chairman and money man behind AIM is Jeremy Halbreich, former president and general manager of The Dallas Morning News and former chairman and CEO of of Sun-Times Media. Among other things, Halbreich helped resuscitate the Chicago Sun-Times, a tabloid that had gone into bankruptcy in 2009 under previous ownership. One thing you need to know about Tribune is it’s a certifiable disaster as a company. Since 2000, when it acquired the Times Mirror company (which owned The Los Angeles Times and Baltimore Sun, among others), it has suffered under terrible management, as well as experiencing the steep advertising and circulation losses that have left many metropolitan dailies shells of their former selves. In my opinion, Tribune would have its best chance to survive and rebound under AIM, the only one of the three suitors led by a person (Halbreich) with a proven record of successful newspaper management. I don’t believe McClatchy is going to end up with Tribune. It shouldn’t. It would be a farce. Like Tribune, McClatchy is an awful company. It shouldn’t be given a chance to swallow a second whale after puking up the first. Excellent summary and analysis, Jim. It will be interesting to read McClatchy’s 3rd Quarter earnings report, which is scheduled to be released Friday, Nov. 9. From what I read, the company is expected to announce another losing quarter. I wonder how they’ll dress this one up…I’ll be out of town; it’ll be up to you to interpret! I’ll do my best, Jim. Have a good trip! One of mt best memories of my time in Chicago, around the late 1980s was wandering up to Evanston in search of a certain bookstore. Had to park a bit away and as I headed for the bookstore I noticed an extremely well-dressed man at a corner seeming to engage in casual conversation with a woman who was passing by. The woman moved on and as I approached the gentleman asked me if I was a subscriber to the Chicago Tribune. I said no, but that my son-in-law bought the Trib to read on the after-work train trip and that I read the newspaper when he got home. He countered that if I had my own subscription it would be delivered to my doorstep and I wouldn’t have to wait for my son-in-law. I had to wonder what motivated such a well-dressed, articulate individual. and after a bit more conversation he revealed that “upper management” of the Trib required that the employees go out once a year and sell subscriptions to the general public. In my mind I wondered how KCStar and Times employees would react if the then current policies would require them to go about trying to sell subscriptions. And the gentleman was handsomely garbed in what had to be expensive attire — I was certain that he had to be part of the Trib “upper management” ranks. Finally, I divulged my connection with journalism, and we had a lovely talk. He gave me his business card, which I failed to keep, sadly, because I’ve been curious as to whether he survived later changes. Is he still part of Tribune “upper management”? I wish I knew. McClatchy released its 3rd Quarter results today. Digital subscriptions are up, but the company continues to bleed red ink amid falling revenues. Thanks for your follow up, Julius. As expected, the situation continues to look grim, sorry to say. I also appreciate your follow up on the old Star buildings redevelopment. You’re welcome, Jim! A Good Weekend to All.